[transcribed] Discover Wayne County Trails! Join Wayne County Trail Works, Wegmans and Cornell Cooperative Extension to explore the beauty and diversity of nature in our own back yard. Share the wonders of the great outdoors with your family, have fun, win prizes and get healthy at the same time. Here is your opportunity to discover and experience the beauty and solitude of nature, a variety of wild life, the magnificence of natural settings-and the health benefits of becoming more active. The Passport to Family Wellness sponsored in partnership with Wegmans, Trail Works, and Cornell Cooperative Extension Wayne County- Eat Well Play Hard program launched on April 1. Various trails throughout Wayne County will have designated trail marker rubbings that hikers will record in their passport on their visit using a pencil or crayon. Incentives can be claimed upon completing 6, 12, and 16 trails. 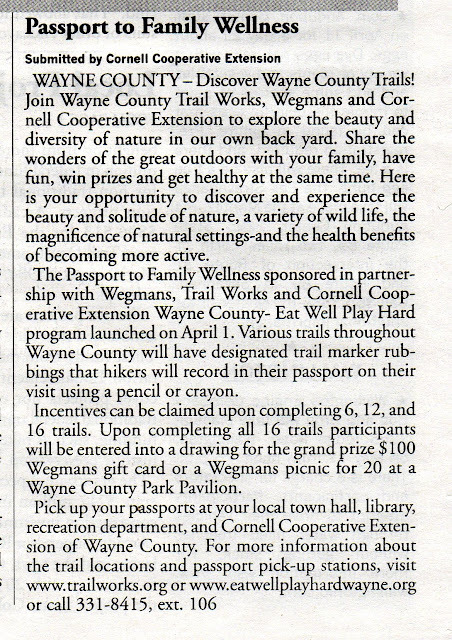 Upon completing all 16 trails participants will be entered into a drawing for the grand prize $100 Wegmans gift card or a Wegmans picnic for 20 at a Wayne County Park Pavilion. Pick up your passports at your local town hall, library, recreation department, and Cornell Cooperative Extension of Wayne County. For more information about the trail locations and passport pick-up stations, visit www.trailworks.org or www.eatwellplayhardwayne.org or call 331-8415, ext. 106. 3 Comments to "Passport to Family Wellness"
They went through over 50 passports at the Red Creek Community Center already, Think we need a registry on www.trailworks.org to keep track of all the participants!! 1/16 of the Wayne County passport trails complete for me! Today was the Bicentennial Trail in Pultneyville; I'll capture my video and photos and make a WayneCountyLife.com post about it.